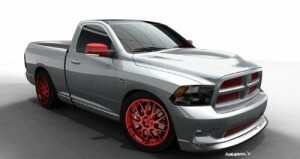 Ram brand will also be present at the SEMA show with some very fine creations based on their heavy duty trucks. It benefits form Mopar Underground features, such as reverse deep-cowl aluminum hood design with functional heat extractors is inspired by the new Dodge Charger SRT8 and smoked lenses cover all exterior lighting. The Ram 392 Quick Silver is lowered 2 inches with the help of a custom suspension kit. The “slammed” look is made more evident by a Mopar body kit, consisting of sill and box pieces, finished up with a chin spoiler.